Twenty years ago, mobile phones were big brick-like affairs. But in January 1996, Motorola changed people’s perceptions with the Motorola StarTAC clamshell phone – a device that was half the weight of the competition, and which would easily slide into your pocket. Perhaps the first recognisable clamshell phone, the original GSM StarTAC weighed about 115 grams and set a form factor that became the standard for this type of device. Of course, this being the 1990s, the StarTAC didn’t have much in the way of features, but it was the small size and weight that got all the attention. Unlike most later clamshell phones, the StarTAC squeezed both the keypad and monochrome screen onto one half of the inside which made everything rather cramped. There was no camera on the outside, but there was an easily removable battery and an extendable antenna. 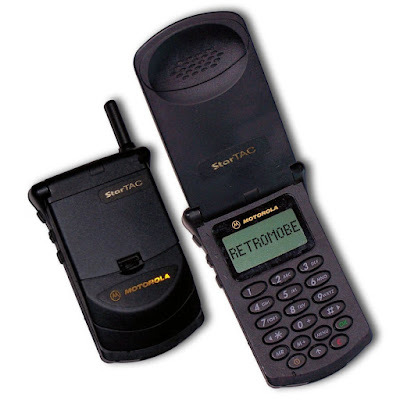 The StarTAC was available on most networks, including GSM and CDMA plus the old AMPS analogue system. It was also sold in most major markets worldwide, which lead to significant sales. But it wasn’t cheap – originally costing between $1500 to $2000, the StarTAC was more expensive by weight than gold. Despite the excellent hardware design, the phone was actually rather difficult to use. Motorola’s clumsy and clunky user interface was poorly thought-out, and even though rivals Nokia were still producing more brick-like handsets, they were at least much easier to use. And crucially, those Nokia phones had Snake on as well. Motorola didn’t really have another hit on the same scale as the StarTAC until it created the RAZR in 2004, a handset which had many of the same innovations and flaws as the StarTAC itself. "Perhaps the first recognisable clamshell phone, the original GSM StarTAC..."
The first recognizable 'clamshell' or flip phone waqs the Motorola DPC500 from 1992. I was there. I sold them. Lots of them. The StarTAC came much later. Startac rocked all on my Car Club at that time had one ,We thought we were cool. Very nice phone.